Typical Humidistat and Thermostat Setting for Venice Fl. Area - Humidistat at What %? 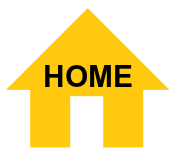 Setting of the humidistat & thermostat can be confusing especially since they are mostly set only twice a year. Come spring When you leave Venice for the summer, Set the Humidstat to 57 , and Thermostat to Cool – 77º and Fan to Auto. 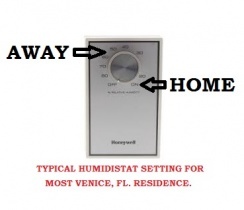 When you arrive to Venice you will Set the Humidistat to ON, and the Thermostat as you normally do. 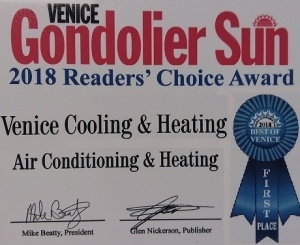 Do to variations in construction and different types of homes, Venice cooling highly recommends to have your house checked on a weekly basis to ensure the air conditioner is operating properly and humidity is being maintained at the optimum levels, as an option it might be good to remotely monitor the temperature and humidity with a Wi-Fi thermostat.